The Green Sea Turtle, Chelonia mydas, returning to the sea after laying her eggs. Today's turtles (the clade Chelonia) and the other now extinct members of the Testudines, being quite similar in overall morphology, probably had a similar mode of life, and even the extinct Testudines show some diversity in life history characteristics and inferred ecological niches. Whether the first turtles (the ancestors of the other Testudines) were marine, freshwater, or terrestrial is a matter of much debate; the earliest known turtle, Proganochelys was probably terrestrial, so it is likely that the first turtles were likewise primarily land-dwelling. We can deduce much of what early turtles were like by looking at their living relatives, but must do so with a certain amount of caution, as we cannot a priori assume that extinct animals which appear similar to living ones were identical in habits. Today's turtles do inhabit a wide variety of environments: the open seas, tropical reefs and coastlines, saltwater marshes and estuaries, freshwater areas of all sorts, and most non- arctic terrestrial biomes; including deserts, rainforests, mountains, and prairies. Fossil turtles are found in roughly the same range of habitats. The leatherback turtle Dermochelys and some other sea turtles are known to range close to the poles; no fossil turtles have been found in these regions, but few people have looked (we don't really expect to find them either; the living sea turtles are a more recent group). All turtles may share similar horny beaks, but they eat a wide variety of food, including such seemingly inedible things as cacti, deadly poisonous jellyfish (the modern hawksbill turtle dines on such unsavory things as the Sea Wasp, which carries one of the dealiest natural toxins known to science), squid and other mollusks, fish of many types, and so on. Some african freshwater turtles have been known to stalk and devour shorebirds, attacking in hungry mobs (certainly a horrific experience, being jumped by a gang of voracious terrapins). It is quite likely that the extinct Testudines likewise had a similar range of dietary preferences. Proganochelys was similar to a modern tortoise, so it may have been an herbivore like the Galapagos tortoise Geochelone. Being amniotes (vertebrates whose eggs have an amnion), all turtles retain the basic strategy of laying eggs in nests, always on land (either buried in sand or vegetation usually). As you probably know, this has been a major (but not the only) factor in the endangerment of many modern sea turtles; the eggs are abandoned to the mercy of predators, and many nesting sites have been lost to human development of coastline areas. Juvenile turtles often have different ecological niches from their larger parents; especially as prey for the multitude of predators that await their hatching. However, turtles in general have relatively long life spans and mate repeatedly, so their generalized life history strategy of producing many young for natural selection to cull from seems to have worked well. 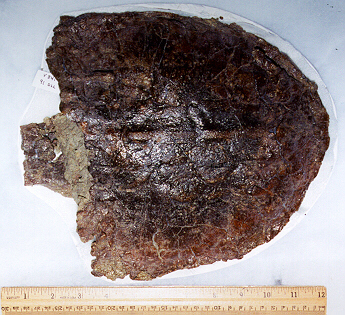 The fossilized carapace (shell) of a turtle from the Hell Creek formation of eastern Montana, USA; about 65 million years ago. These turtles lived in the rivers, lakes and streams of that area much as their relatives do today. However, these turtles lived alongside crocodilians, champsosaurs, dinosaurs, and other animals, many of which went extinct after the Cretaceous period -- unlike the turtles. As previously stated, turtles range in diets and habitats, and thus fill a variety of ecological roles. The armored shells of turtles may seem impregnable, but still the turtles have their predators -- sea turtle adults and juveniles alike must deal with sharks and similar threats; aquatic turtles have large fish, predatory birds, some mammals, and crocodilians to deal with, and even the heavily armored terrestrial turtles occassionally fall prey to cunning predators who find their weaknesses -- enterprising lions are known to crack open tortoises, and coyotes in the arid American regions probably are dangerous to smaller turtles. The legendary tough shell of the turtle is not a suit of invulnerability, although it does help -- tortoises have ben known to survive wildfires in grasslands by withdrawing into their shells, and that same behavior doubtless frustrates many predators. Extinct turtles certainly had their share of dangers; one may wonder how they ever got by during the age of dinosaurs, although the giant Mesozoic sea turtle Archelon (which reached some eight feet in diameter) probably was fairly secure in its portable fortress.